Sazon Goya - Inside this box you'll find what good cooks have always dreamed of, an absolutely fool proof way to make everything taste not just good, or even great, but sensational - every time. 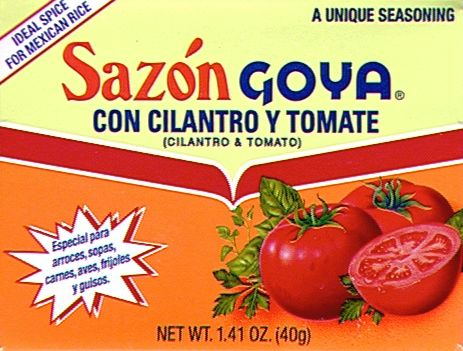 It's Sazon Goya, a special mix of seasonings from Goya. A little magic in little foil packets. Just cook the way you always cook, the same recipes, the same seasoning, changing nothing. Except: for every 4 people your recipe serves, just add one packet of Sazon Goya. Two packets for a dish for 8. You'll wonder how you ever did without it. Use it for meats, stews, soups, poultry, pasta, rice, beans, vegetables - everything. 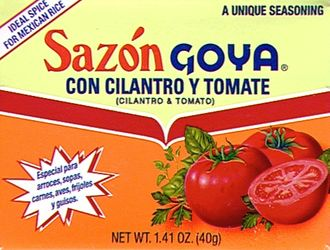 Sazon Goya will add more flavor to your food. If it is Goya, it has to be good! Ingredients: monosodium glutamate, salt, dehydrated tomato, dehydrated garlic, spices, yellow 5, and red 40, tricalcium phosphate (anti-caking agent). Sazon Goya - Dentro de esta caja encontrara lo que los cocineros siempre han sonado, una una manera absolutamente infalible para hacer que todo, no solo lo bueno sepa bueno, o incluso estupendamente, pero sensacional - cada vez. Es Sazon Goya, una mezcla especial de condimentos de Goya. Un sobrecito de este condimento especial para carnes, aves, vegetales, frijoles y guisos, le dara a dichos platos un exquisito sabor y un precioso color. Anada el contenido completo de un sobrecito al agua (o caldo) con que prepare estos platos y condimentelos como usted siempre acostumbra para que toda la familia quede encantada. Pongale mas sabor a sus platillos con Sazon Goya. Ideal para frijoles, arroces, sopas, carnes, pollo y guisos. Disfrute! Si es Goya, tiene que ser bueno! Ingredientes: glutamato monosodico, Sal, tomate deshidratado, ajo deshidratado, especias, amarillo 5, rojo 40, fosfato ticalcico (antiaglutinante). I use this to season my chicken for entomatadas, a mexican dish similar to flautas or enchiladas but served with a very different sauce and cheese. Anyway, it helps my entomatadas turn out just like my Mom's back in Texas. Very happy with this seasoning. It makes the dish every time!